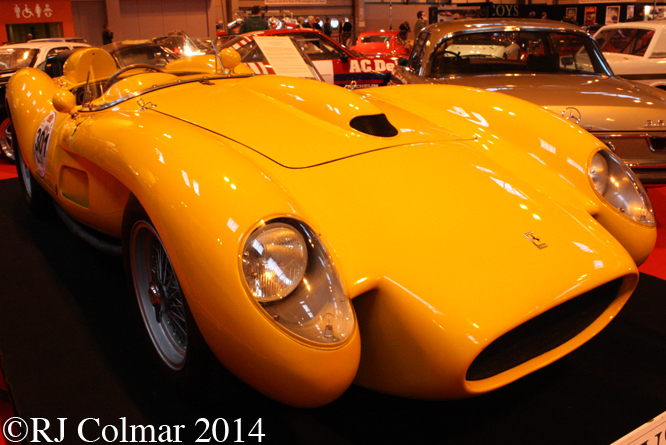 Somewhere around 1980 Pink Floyd Drummer Nick Mason entered into negotiations to purchase ERA 10B and found that he could only buy the car on condition that he bought a Maserati 250F, today’s featured car, as part of the package. 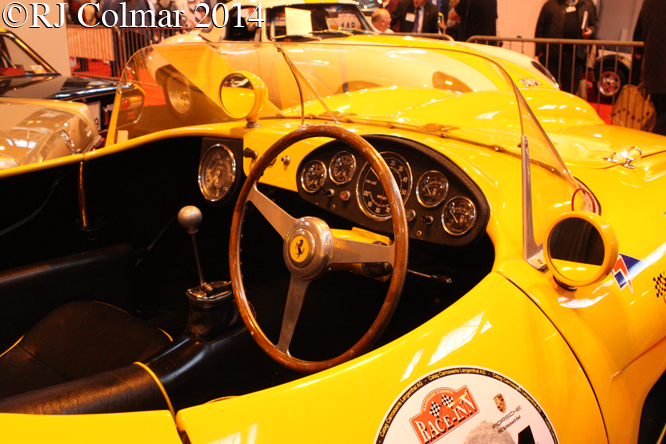 Nick bought both cars and found that the 250F had a 1957 lightweight chassis which turned out to be #2530 to which people had fitted numerous incorrect parts including a Chevrolet V8. 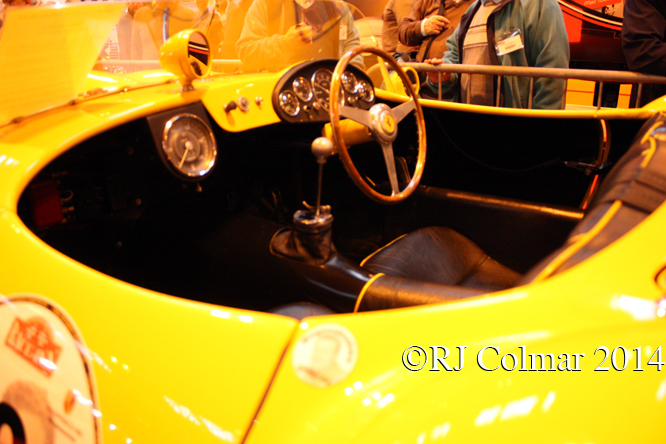 Nick described the car as a “basket case” and recalls the car being described as a ladder for import purposes. 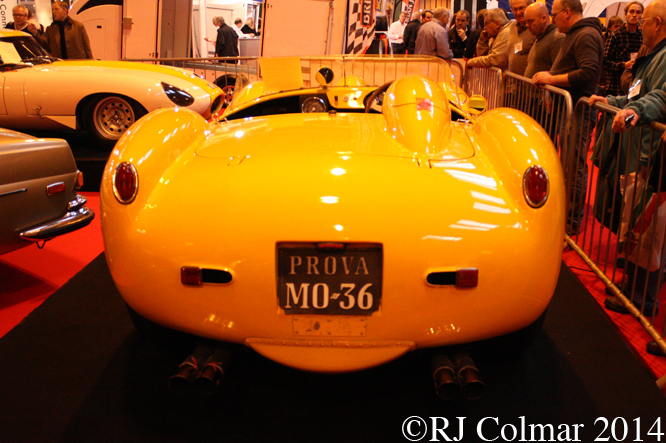 #2530 was originally fitted with a V12 motor but never raced with it, later in 1958 #2530 was fitted with a six cylinder motor and sent to South America. It appeared in the 1960 Argentinian Grand Prix with the chassis number #2532 where Gino Munaron drove the car to a 13th place finish. To keep you on your toes Antonio Creus drove another 250F in the 1960 Argetinian Grand Prix this was chassis #2526 which carried the #2530 ID tag ! Antonio retired from with driver fatigue. Towards the end of 1960 Brazilian Rugeno Peruzzi bought the car and between 1962/64, according to David McKinney’s Maserati 250F, it appears to have been raced by Camillo Cristofaro with a Chevrolet V8 in the engine bay. 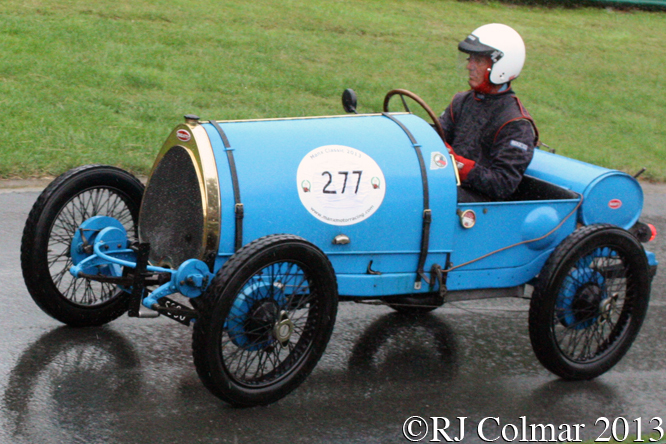 Colin Crabbe found the car with out any identity in the early 1970’s and Nick had the frame replaced by a new one to the correct 1957 lightweight specification. Rob Hall is seen yumping #2530 at Cholmondeley Pageant Of Power at the top of the post while Charles Knill-Jones, a member of the Ten Tenths team which looks after Nick Mason’s many cars, is seen in period attire hustling Nicks 250F around Castle Combe at last years Autumn Classic meeting. 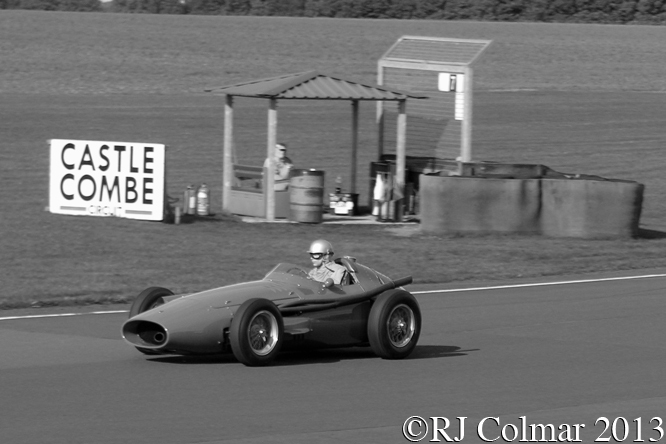 My thanks to Castle Combe historian Pete Stowe for letting me know who was driving #2530 at Castle Combe. 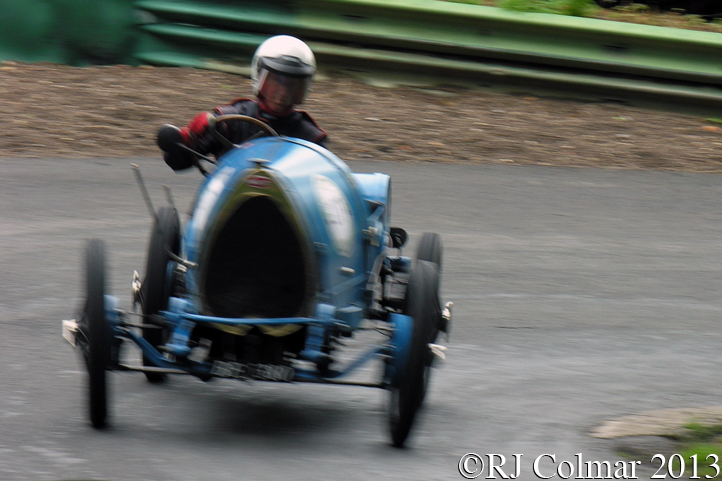 Thanks for joining me on this “Importing A Ladder” edition of “Gettin’ a li’l psycho on tyres” I hope you will join me again tomorrow for a look at a vintage Bugatti. Don’t forget to come back now ! 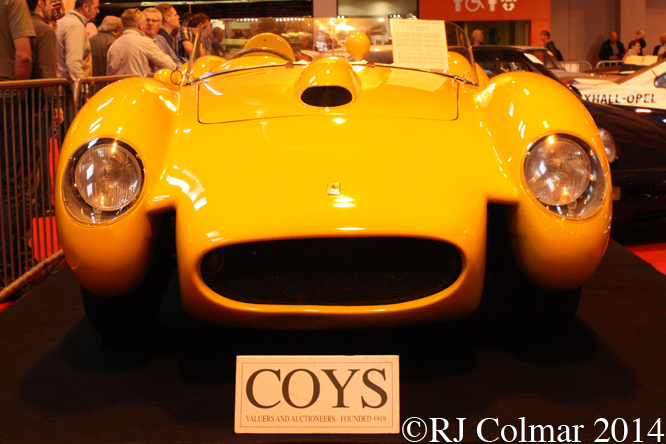 This entry was posted in Uncategorized and tagged 250F, Autosport International, Autumn Classic, Castle Combe, Chevrolet, Cholmondeley Pageant Of Power, Colmar, Crabbe, Cristofaro, Formula One, GALPOT, Hall, Knill-Jones, maserati, Mason, Munaron, Peruzzi, Racing Car, Ralph on March 24, 2014 by Ralph. 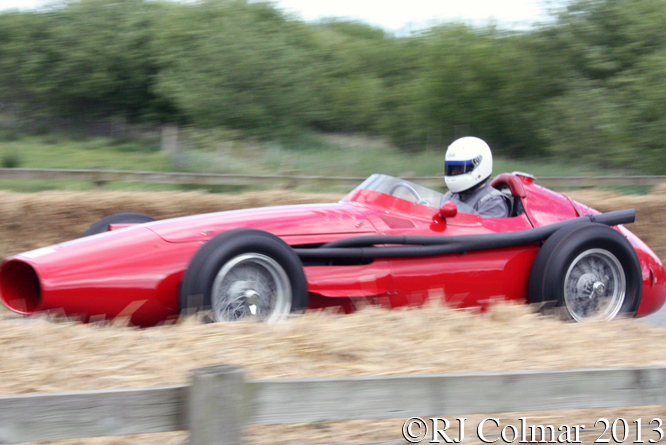 For the 1957 season Maserati manufactured 3 lightweight versions of the 250F to keep pace with the Lancia Ferrari D50’s which Juan Manuel Fangio drove to his fourth World Drivers Championship title in 1956. Third of the three T2’s was chassis #2529 which was shared during 1957 between Stirling Moss, Harry Schell and the returning ‘Old Man’ Fangio who despite his success was not overly enamoured by his time at Maranello. Fangio won the opening two championship races of the 1957 season at home in Argentina and in Monaco, the third race of the Championship season was the Indy 500 for which only Giuseppe Farina of the regular World Drivers Championship contenders was entered. Farina did not start the ’57 Indy 500 which was won by Sam Hanks in the Epperly Special. 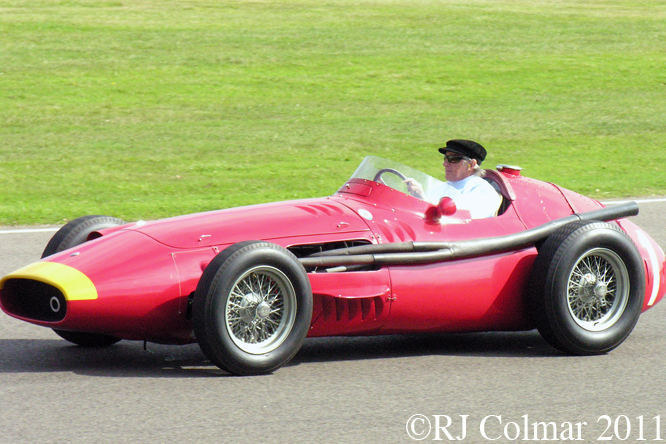 Fangio then drove today’s featured 250F T2 chassis #2529 to victory in the 1957 French Grand Prix. At the British Grand Prix Fangio retired #2529 with an engine problem leaving Tony Brooks and Stirling Moss to share the first championship Grand Prix victory for Vanwall. Fangio qualified #2529 on pole, with a time 16 seconds faster than he had driving a Lancia Ferrari 1956, for the 1957 German Grand Prix alongside him Mike Hawthorn qualified 2nd in his Lancia Ferrari with the lightweight 250F T2 of Jean Behra and Lancia Ferrari of Peter Collins filling out the front row of the grid. On a hot day at the Nurburgring on August 4th 1957 the Ferrari’s of Hawthorn and Collins set off into an immediate lead of the 311 mile German Grand Prix, but by lap 3 Fangio had passed both and unbeknown to the Englishmen sailed off into the distance in order to make a large enough lead to enable him to make a scheduled pit stop, having started the race like Behra in fourth on half empty tanks. During his pit stop Behra lost time when he broke his filler cap off while climbing back into the car. Fangio was even less fortunate spending 54 seconds in the pits after a mechanic had lost a wheel nut. 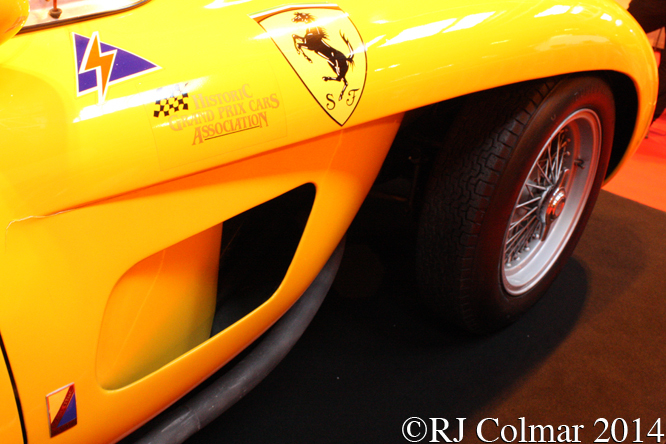 Fangio rejoined the race in third place 48 seconds behind the battling Howthorn and Collins. Over the next 10 laps Fangio broke the Nurburgring lap record nine times seven times in succession passing Hawthorn for the lead on the penultimate lap with two wheels on the grass to record possibly the greatest Grand Prix victory ever, enough to secure “El Maestro” his fifth and final World Championship Victory. 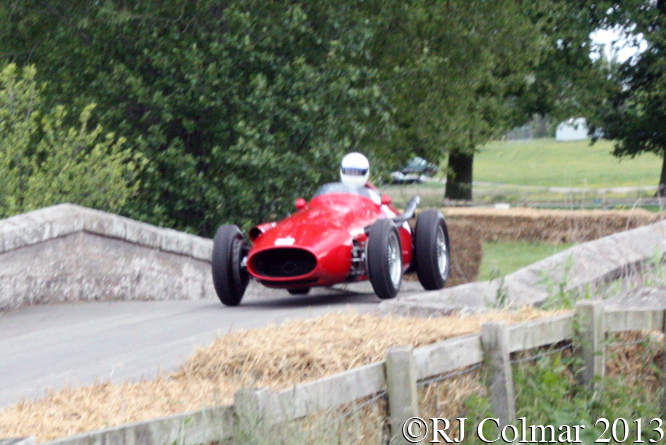 As it turned out Fangio would not win any more championship Grand Prix races before retiring mid way through 1958, meaning the car #2529, seen driven by Sir Jackie Stewart at Goodwood Revival above, was the won in which possibly the greatest driver of all time won his last two Grand Prix victories. 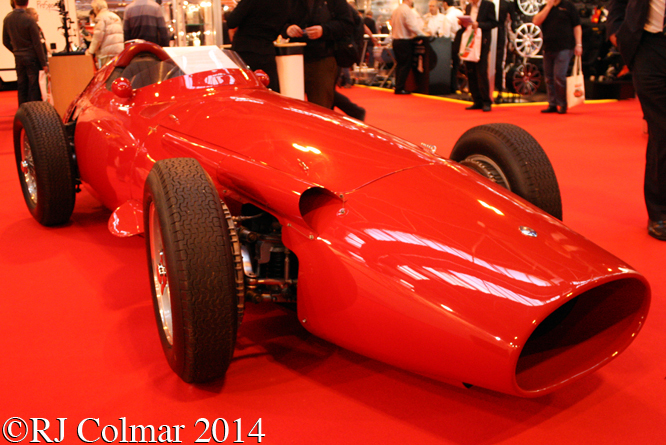 Unusually unlike many of the other Maserati 250F’s it’s number was never used on any other chassis nor did it ever carry any other chassis number. 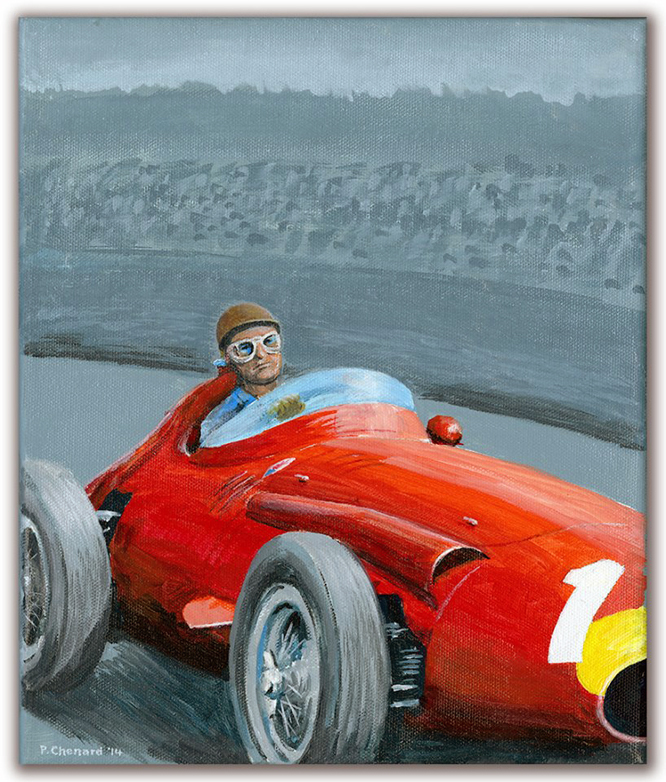 Fangio drive #2529 to second place finishes championship races at Pescara and Monza with Harry Schell taking the car over for the GP Modena where he finished 3rd. Fangio drove the car to 4th with fastest lap in the non championship 1957 GP du Maroc and 4th in the opening round of the 1958 Championship in Argentina. The car was then sold on to Scuderia Sudamericana who entered #2529 for Giorgio Scarlatti and Jo Bonnier who achieved little by way of success apart from a win for Bonnier in a non championship Formula Libre race at Watkins Glen. Scuderia Ugolini entered the #2529 again for Giorgio Scarlatti in 1959 it’s final championship appearance being in the 1960 Argentinian Grand Prix from which Scarlatti retired with overheating issues. 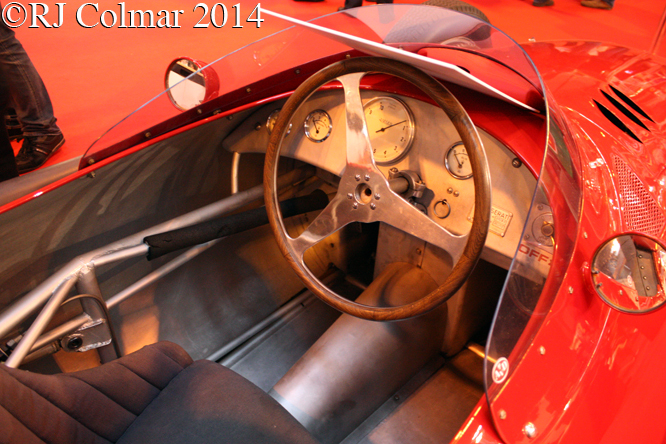 After spending time in the Briggs Cunningham museum #2529 was bought by Hartmut Ibing in 1988 in a silent auction. I did not realise it at the time I took the photograph but having Sir Jackie Stewart drive Fangio’s ’57 German Grand Prix winning car at Goodwood was particularly pertinent because Sir Jackie also took a famous win at the Nurburgring, but this time in the rain in the German Grand Prix of 1968. 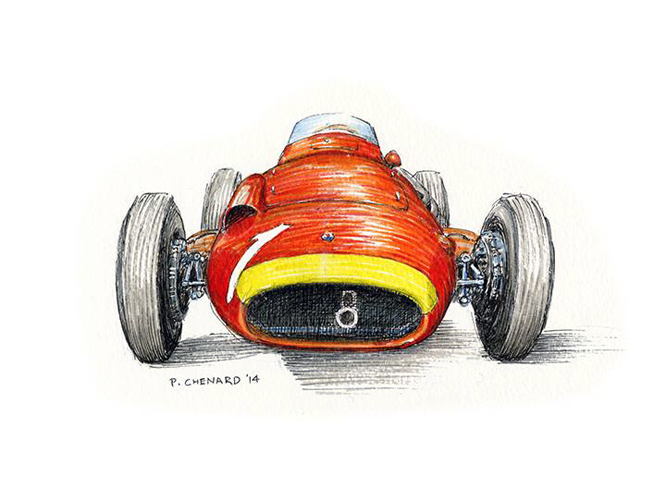 My thanks to Paul Chenard for kindly allowing me to use reproductions of his artwork in today’s post. Thanks for joining me on this “Ringmeister” edition of “Gettin’ a li’l psycho on tyres” I hope you will join me again tomorrow when for a look at a Bugatti. Don’t forget to come back now ! 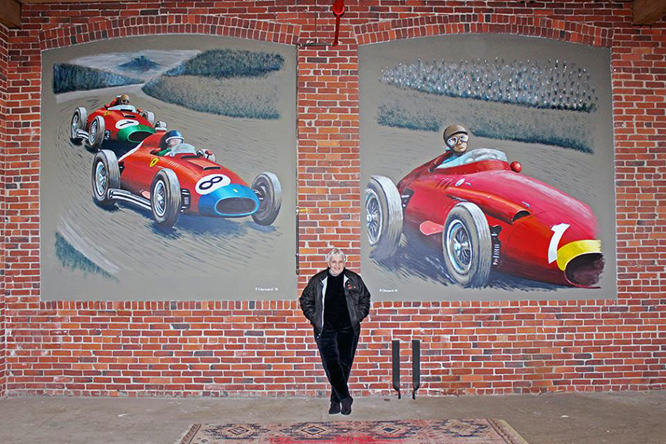 PS in a fitting tribute to David McKinney who wrote the definitive “Maserati 250F” last weeks featured 250F #2522/16/23/26 now owned by Graham Adelman was present at Davids funeral last week. My thanks to Tim Murray for forwarding this information. This entry was posted in Uncategorized and tagged 250F, Bonnier, Chenard, Colmar, European Motorsports, Fangio, Formula One, GALPOT, Goodwood Revival, Lightweight, maserati, McCluggage, Mckinney, Moss, Nurburgring, Paul, Racing Car, Ralph, Scarlatti, Schell, Stewart, T2 on March 17, 2014 by Ralph. Ever asked a question of fact and got a different answer dependent upon whom is answering ? Ask any number of people what today’s car is and they will agree it is a 1973/4 Williams but after that it gets complicated. 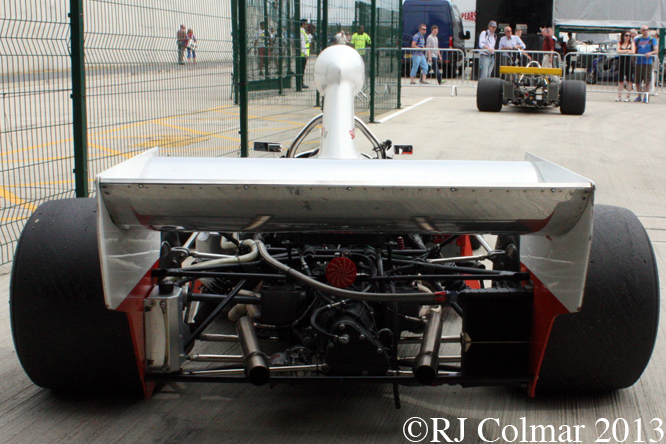 The Williams IR series cars first appeared at the 1973 Spanish Grand Prix replacing the FX3B Williams design, known in 1972 as Politoys, that did not have deformable structures protecting the fuel tanks. 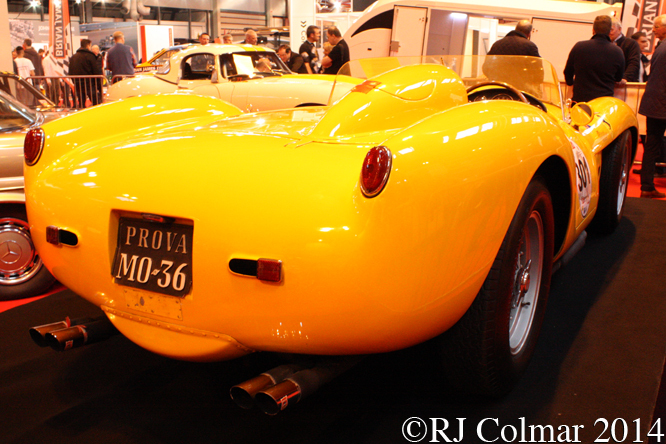 The IR initials were a nod to one of the teams sponsors namely ISO Rivolta. 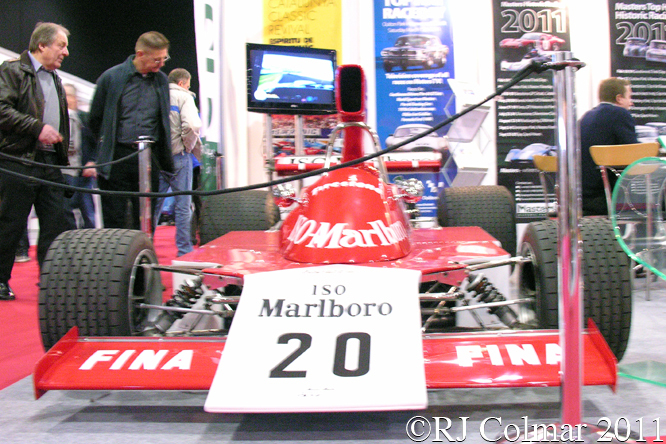 A new car, IR/03 featured today, to the same design as the 1973 cars, appeared at the 1974 Spanish Grand Prix for Arturo Mezario. Denis Jenkinson (DSJ) correctly reported after the Spanish Grand Prix that Frank Williams had renamed the cars with FW initials, but either idiosyncratically or incorrectly that the latest chassis IR/04 was hence forth to be known as FW/04. DSJ continued referring to IR/04 until the 1975 non championship Race of Champions. However DSJ was possibly confused by the fact that the original IR/02 was damaged and the chassis tub replaced during repairs. 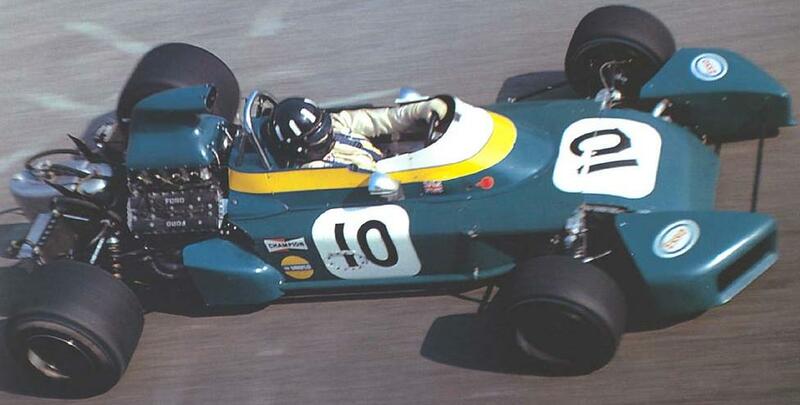 While the new car seen at the 1974 Spanish Grand Prix was built around the 4th IR tub it was given the IR/03 chassis number and post the Spanish Grand Prix this fourth chassis seems to have been referred to by everybody apart from DSJ as FW/03. 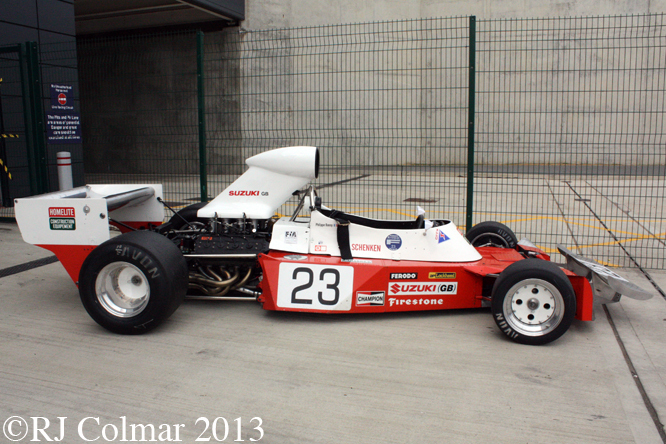 DSJ correctly referred to this car as FW/03 at the non championship 1975 International Trophy and correctly mentions that the new car driven by Art Mezario at the following 1975 Spanish GP as FW/04 ! As if to confirm the respected DSJ’s error no mention is made of chassis IR/04 / FW04 in a MotorSport article about cars entered by Frank Williams from 1969 upto April 1975. Today’s featured car’s best result came in the 1974 Italian Grand Prix where Art Mezario managed to coax IR/03 / FW03 to a fourth place finish at Monza. 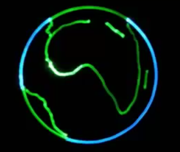 This result plus Art’s sixth place finish in South Africa were enough to secure Williams a second consecutive 10th place in the 1974 World Constructors Championship. During 1975 Tony Brise, Damien Magee, Ian Scheckter, Francois Migault, Ian Ashley, the seriously obscure Jo Vonlanthen and Renzo Zorzi all drove IR/03 / FW/03 without much success, Brise recording a best 7th place finish in the 1975 Spanish GP on his Formula One debut. In 1977 IR/03 / FW/03 now belonging to Swiss Loris Kessel turned up at the Italian GP with a raft of safety upgrades and some cool new body work by ex Ferrari designer Giacomo Caliri from his FLY-studio. 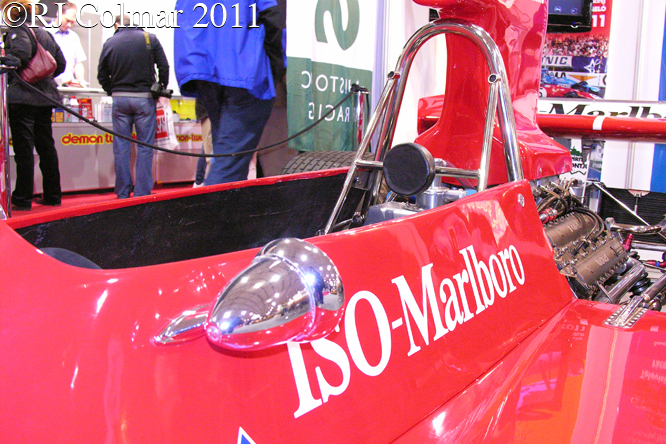 Renamed the Apollon Fly Loris failed to qualify for the race, IR/03 / FW03 was restored to the 1974 spec seen here in 2010. My thanks to Michael Ferner at The Nostalgia Forum for confirming DSJ’s idiosyncratic refferences to IR/03 / FW/03 as IR/04 / FW/04. 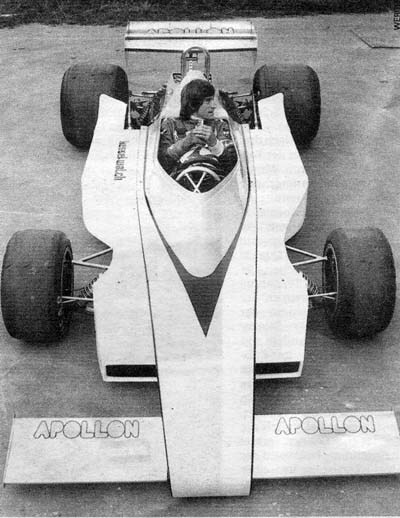 This entry was posted in Uncategorized and tagged Apollon, Ashley, Brise, Caliri, Cosworth, DSJ, Fly, Formula One, FW03, IR/03, Kessel, Magee, Mezario, Migault, Race Retro, Racing Car, Ralph Colmar, Scheckter, Vonlanthen, Williams, Zorzi on March 16, 2014 by Ralph. In 1989 Sir Jackie Stewart’s son Paul started a Formula 3 open wheel programme with his own team Paul Stewart Racing which ran two cars. After being consistent championship contenders the team graduated to Formula 3000 and after a season Paul decided his future lay in team management and his team won six Formula 3 championships with Gil de Ferran, Kelvin Burt, Jan Magnussen, Ralph Fairman Jr, Jonny Kane and Mario Haberfeld. 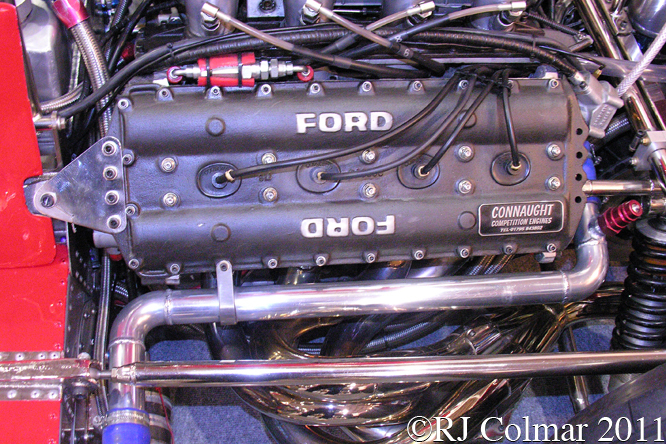 In 1996 Paul Stewart and his father founded Stewart Grand Prix with Sir Jackie convincing the Ford board in Detroit to underwrite a V10 engine programme with Cosworth. The team one the 1999 German Grand Prix in it’s third season before being sold to Ford who rebranded the team Jaguar for the 2000 season. Jaguar Racing’s only success was two third place finishes in 5 years and Ford concluded there was no point continuing the programme after 2004 when the ambitious Red Bull energy drinks company stepped in to buy the team for the 2005 season. In the first four years of operation Red Bull Racing scored just three 3rd place finishes but things started to change once they hired über aerodynamicist Adrian Newey from McLaren for the 2007 season by 2009 Mark Webber and new boy Sebastian Vettel had scored six victories between them and Red Bull Racing finished 2009 second in the constructors championship with Vettel 2nd in the drivers Championship. 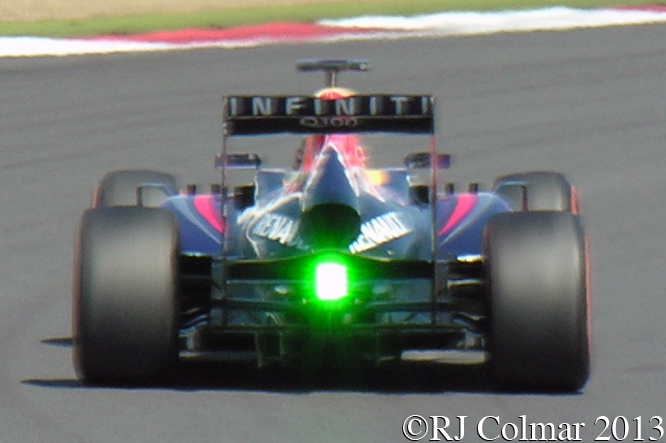 From 2010 to 2012 Sebastian Vettel scored a further 21 Grand Prix victories and three consecutive World Drivers Championships six further victories for Mark Webber, seen with the green flashes on his airbox camera, in the same period helped Red Bull Racing secure 3 consecutive World Constructors titles. Clear favourites to win fourth consecutive titles in 2013 the only hiccup to their plans came at the beginning of the season when Red Bull Racing found the mandated tyres did not match their Renault powered RB9 as well as some of the other cars, however after various failures the mandated tyres reverted to 2012 spec and Sebastian and Red Bull Racing never looked back ending the season with 13 Grand Prix wins including the last nine of the season won consecutively to score their 4th consecutive World Championships respectively. Mark managed just five second place finishes before retiring from Formula One to join Porsche’s new sports car programme. 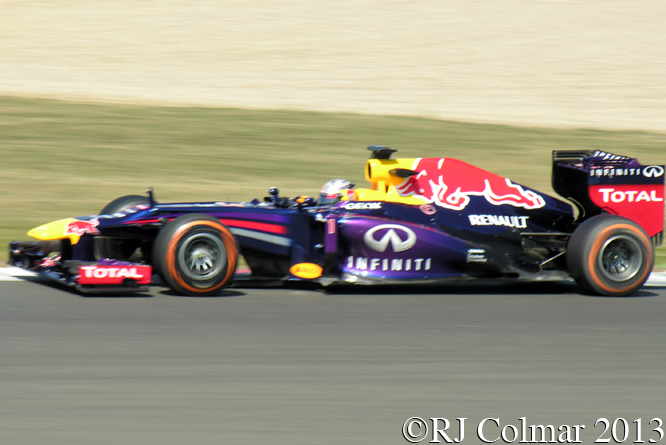 For 2014 Australian Daniel Ricciardo will replace his Mark Webber as Sebastian’s team mate and the signs from testing are that Red Bull Racing may well struggle to get their new Renault turbo powered RB10 hybrid race car to the finish of it’s first race in Australia on Sunday. 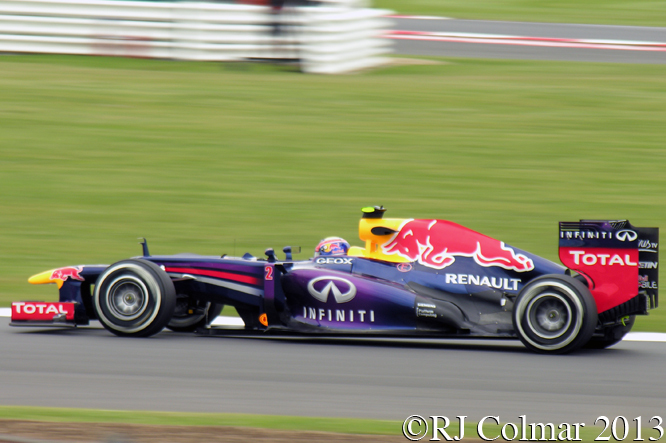 You can follow the fortunes of the Red Bull Racing team on their website linked here, their facebook page linked here and twitter feed linked here. 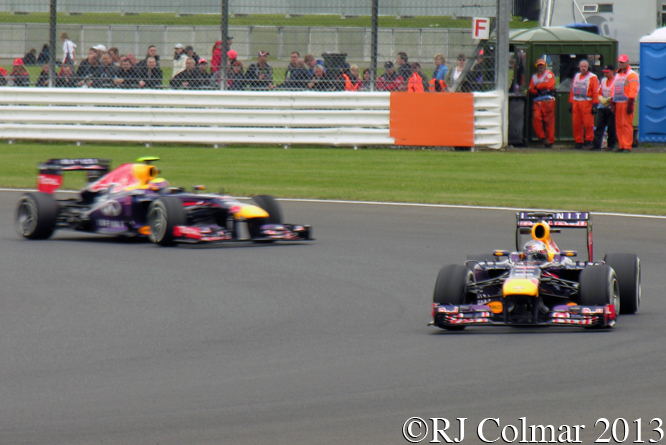 On testing form the 2014 season could be the most open yet my gut feeling is that the Championships will be Hamiltons’s and Mercedes F1’s to loose but what ever their problems now I expect Red Bull Racing to come back strong towards the end of the season for what should be a thrilling finale with the funny little double dose points. Wishing all GALPOT readers a thrilling 2014 F1 season over here at GALPOT tyres we are ready to Go ! Go ! Go ! as Murray Walker used to say. 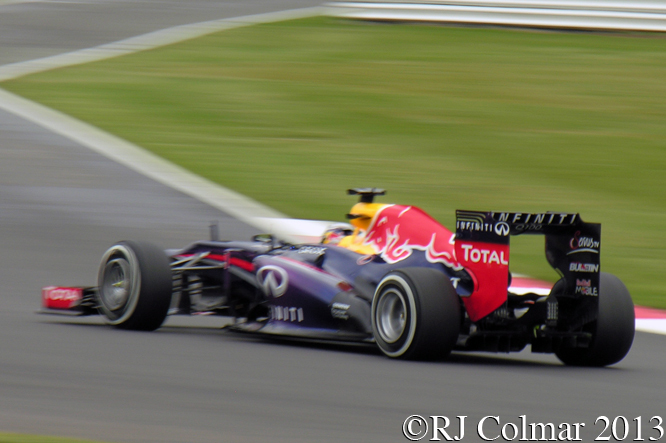 This entry was posted in Uncategorized and tagged Formula One, GALPOT, Jaguar, Newey, Racing Car, Ralph Colmar, RB10, Red Bull Racing, Renault, Stewart, Vettel, Webber on March 12, 2014 by Ralph. 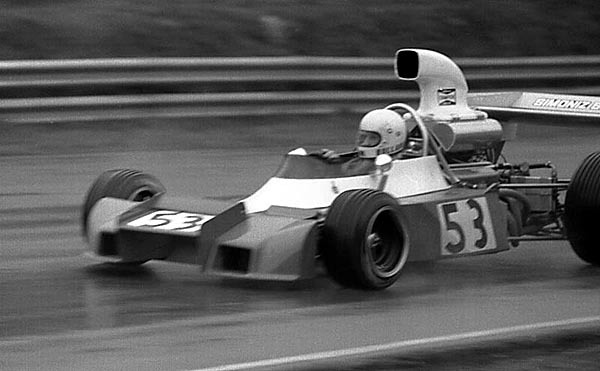 After the successes of the 1973 Trojan T101 Formula 5000 car, particularly in the hands of Jody Schekter in the USA, the company Chairman Peter Agg asked Ron Tauranac to design an all new car for 1974 which would be suitable for F5000, the T102, and Formula 1, the T103 although the Chevy V8 in the former would not be able to be fitted as a fully stressed member as the Ford Cosworth DFV used to power the latter. 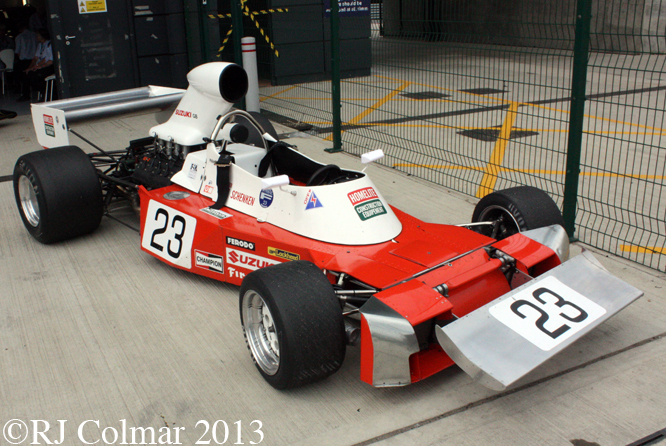 Both the T102 and T103, seen above at last years Silverstone Classic, bore a strong resemblance to the Brabham BT34 Lobster Claw formula one car which Ron designed for the 1971 season. Powered by the, as good as, ubiquitous Ford Cosworth DFV with an equally, as good as, ubiquitous Hewland DG300 gearbox the T103 attracted a minimum of sponsorship from Suzuki GB and Australian Tim Schenken was signed up to drive the car. Like the Amon Cosworth AF101 I looked at last week the Trojan T103 made it’s debut at the 1974 Spanish Grand Prix where Tim qualified 25th, 2 spots behind Amon, but stayed in the race for 54 more laps than Chris before spinning off on oil on lap 76, eight laps early, to be classified 14th. At the Belgian Grand Prix Tim brought the car home 10th and at Monaco Tim qualified 24th on the 25 car grid only to be involved in an incident that removed seven cars from the race on the opening lap. 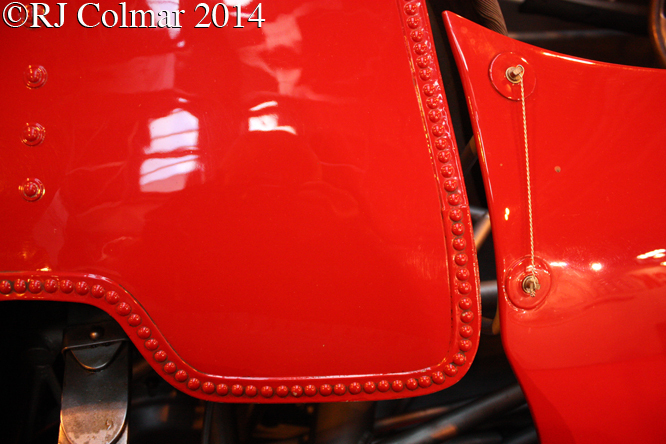 The team was refused an entry for the Swedish Grand Prix, failed to qualify for the Dutch Grand Prix, missed the French Grand Prix and turned up at the British Grand Prix with a new cockpit surround and Ferrari 312 B3 style single piece front wing. 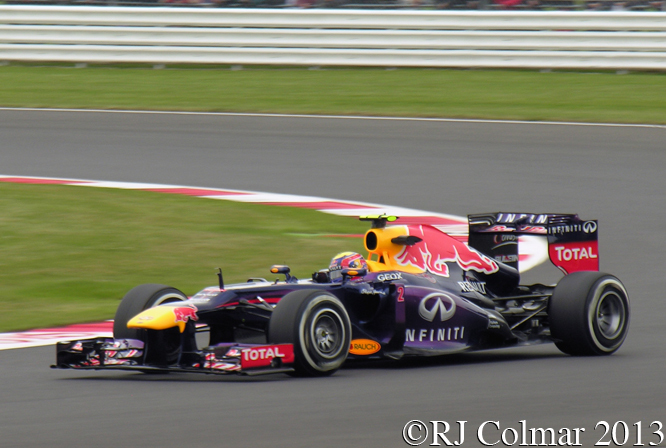 Tim qualified 25th for the British Grand Prix but but was sidelined with a suspension problem on lap 6. Tim and the Trojan proved unequal to the task of qualifying for the German Grand Prix at the Nurburgring, but bounced back by qualifying 19th in Austria where he finished a season equal high 10th. The cars final appearance before the money ran out was at the Italian Grand Prix where Tim qualified 20th and completed 15 laps before the gearbox cried enough. That was pretty much the end of Trojan too, a company that founded in 1914 survived as a manufacturer in it’s own right until the the 1960’s when it started manufacturing first Heinkel bubble cars, then Elva sports racing cars and later McLaren Sports and open wheel racing cars under licence and then manufacturing a hand full of open wheelers of it’s own devising. 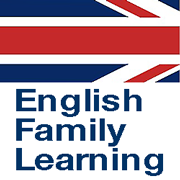 The company was not dissolved until 2013. Tim Schenken’s final Grand Prix appearance came in the 1974 US Grand Prix where he failed to qualify the unloved Lotus 76 27th but took to the grid when it looked like Mario Andretti’s Parnelli would not start but eventually turned up late grid to take his rightful place. Tim took the start only to be disqualified. Tim eventually hooked up with Howden Ganley to found Tiga a successful company making racing cars for the junior open wheel and sportscar classes. 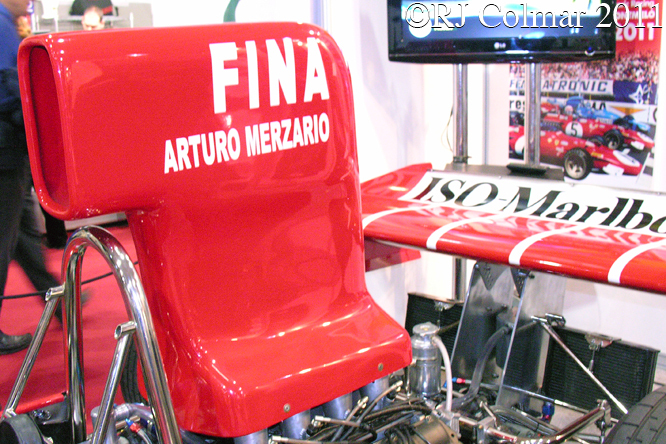 A Tiga chassis tub was started for a Formula One car but it was never finished. 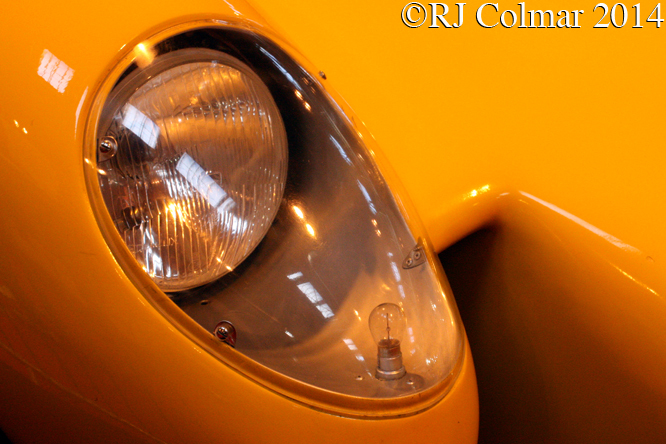 Tiga would also become a successful Group C2 and IMSA Lights manufacturer. 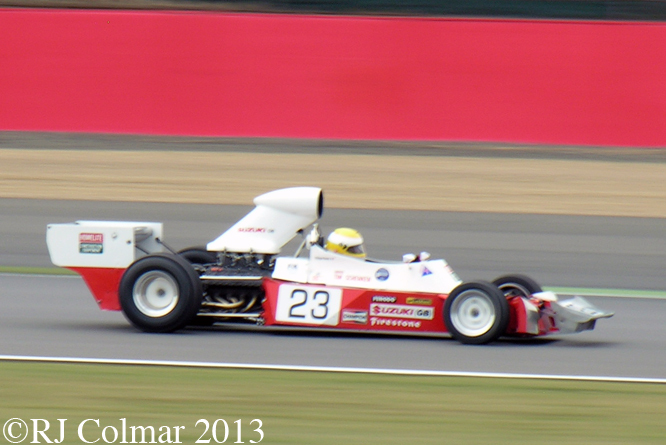 The T103 is seen being driven by owner Phillipe Bonny at last years Silverstone Classic above. Thanks for joining me on this “Son of Lobster Claw” edition of “Gettin’ a li’l psycho on tyres”, I hope you will join me again tomorrow for Maserati Monday. Don’t for get to come back now ! 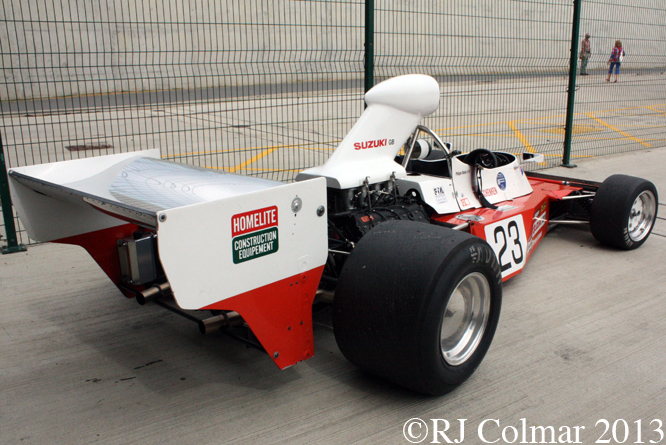 This entry was posted in Uncategorized and tagged Agg, Bonny, Brabham BT34, Colmar, Cosworth, Formula One, GALPOT, Hewland, Racing Car, Ralph, Schenken, Silverstone, Silverstone Classic, T103, Tauranac, Trojan on March 9, 2014 by Ralph. 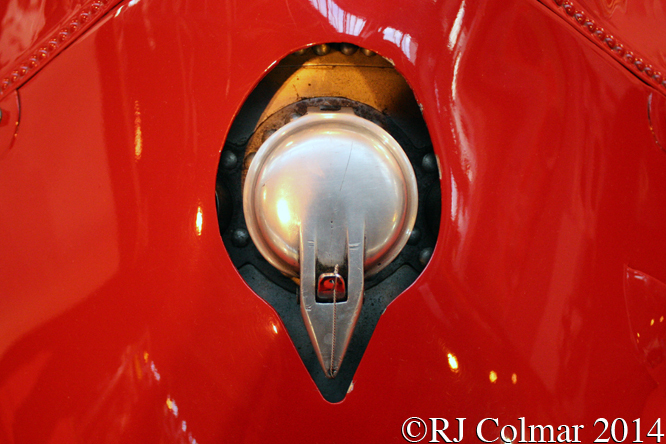 This month’s Tuesday blogs will feature some Vintage Bugatti’s starting with today’s featured Type 13 Brescia. 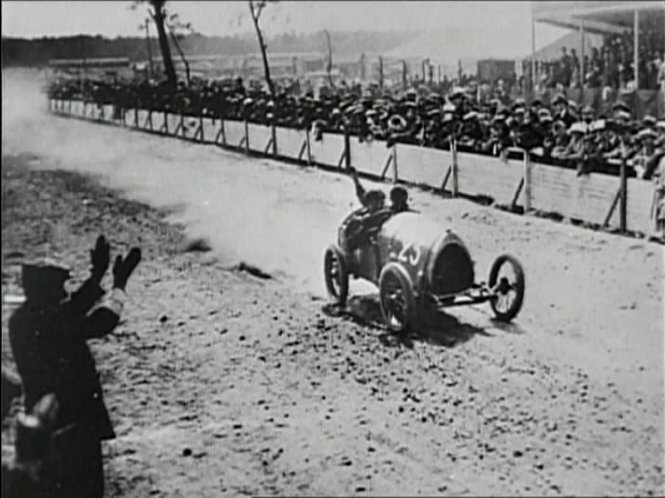 After the success enjoyed by Bugatti following the second place finish in the 1911 French Grand Prix by Ernest Friderich driving a 1368 cc / 83 cui Voiturette Type 13 to the mighty 10 litre / 589 cui winning FIAT S76 driven by Victor Hemery Bugatti future up until the beginning of the Great War hostilities in 1914. At the out break of hostilities Ettore Bugatti took two Type 13’s to Milan and buried the parts of three more for the duration. In 1918 Ettore returned to his factory in Molsheim with his two Type 13’s and built up three more from the buried parts. These cars were entered into the 1920 VIII Coupe des Voiturettes at Le Mans where Ernest Friderich drove one of the cars two victory Team mate Pierre de Vizcaya was disqualified from the event after Ettore was observed by officials to have touched the radiator of the #18 which counted as receiving outside assistance. In September 1921 Ettore sent a team of four cars with slightly larger 1,453cc / 88.6 cui motors to compete in the I Gran Premio delle Vetturette run in Brescia, Northern Italy and after just under 3 hours of racing Ernest Friderich led home a Bugatti sweep of the first four places, subsequently all Bugatti’s with 16 valve heads including the Type 13’s, Type 22’s and Type 23’s fitted with 16 valve head motors, were given the Brescia moniker in memory of the victory. 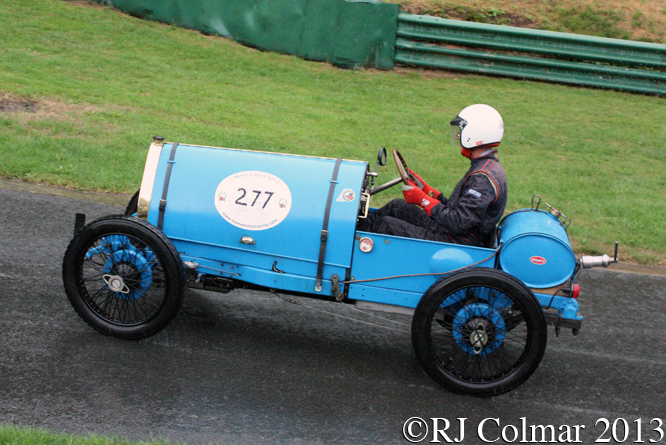 The 1921 Type 13 Brescia seen above driven by Michael Ward at Prescott is notable for having front brakes fitted. My thanks to Michael Fines, Felix Muelas and Barttore at The Nostalgia Forum for their help in determining which cars Ettore sent to Brescia in 1921. Thanks for joining me on this “Do Not Touch The Cars” edition of “Gettin’ a li’l psycho on tyres” I hope you will join me again tomorrow, when I be looking at how the Mercedes Formula One team got on in 2013. Don’t forget to come back now ! 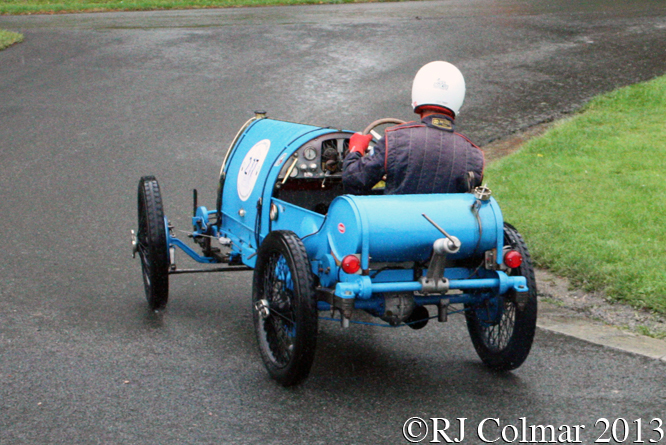 This entry was posted in Uncategorized and tagged Brescia, Bugatti, Colmar, de Vizcaya, Friderich, GAPOT, Molsheim, Prescott, Racing Car, Ralph, Type 13, Voiturette, Ward on March 4, 2014 by Ralph.